The SENSOR-1 Air Planter Population or Seed Flow Sensors are field tested and constructed of solid-state infrared electronics encased in a one-piece, injection-molded plastic housing and sealed with a special epoxy. This sensor is used on most air planters for Seed Flow or Population count. The Air Planter Sensor is designed for the Early Riser monitor with a high rate seed population of over 200,000. The Case-IH Air Seed Flow Sensors are field tested and constructed of solid-state infrared electronics encased in a one-piece, injection-molded plastic housing and sealed with a special epoxy. This sensor is used on most air planters for Seed Flow. SENSOR-1 1200 Planter Sensors for the 1200 Case IH Early Riser Planter are field tested and constructed of solid-state infrared electronics encased in a one-piece, injection-molded plastic housing. This sensor is used on most planters for seed flow or population count. The sensor is designed for single or multiple seed drop for population count or seed flow. 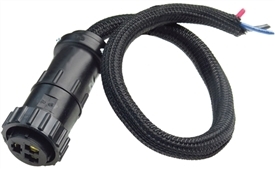 The connector for the 1200 Planter Sensor is available in Weather-Pack Connector. Will not work with the ASM or AFS Monitoring system.